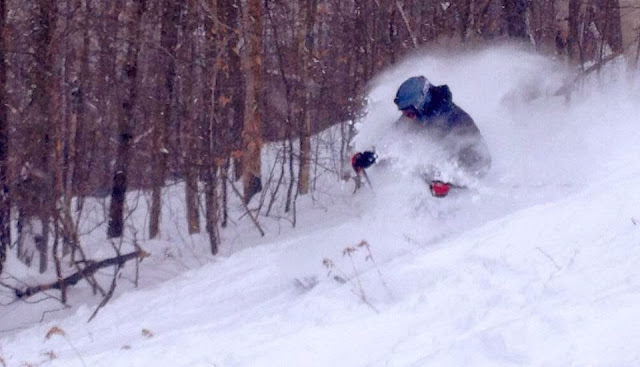 @MaineSkiFamily got day 2 in the books and it was a really good day at Mt. Abram. They received a legit 12"+ of fresh snow and their season is off to a great start. After we dug out in Freeport we made the trek in the ski truck and was skiing by 10:15. Boris Badenov was the trail that received most of the snow making effort early in the year and offered the best base to play in the foot of fresh. We had a blast finding fresh piles of snow and getting air on the many side jumps this trail offers. Here is a GoPro POV video from our numerous powder runs on the day. Mount Abram POWDER! (GoPro) from Alec Salisbury on Vimeo. They were letting some folks on the natural trails and although ski-able, you will still would bottom out if you were not careful. We took a couple runs on the natural trails but played on Boris most of the day. Here are a couple of more pics from the day. All in all a great day to be on a Mountain in Maine. Mt. Abram is on the move with new management and I am really looking forward to see how they are going to do this year. Lots of new things going on including a Friday night race league for the locals. This ski area offers great skiing and riding for all abilities. We highly recommend it especially when the snow is ON. You could go to that bigger place up the road but why pay more and ski elbow to elbow. Go to Mt. Abram and have some fun!